Do you live in Davie? The Three Bean Bakery For Dogs Reviewed by: David Wong Best company to deal with. They are organic, fast with delivery, and my dogs just love their treats. Every year we order a cake for their birthdays. Thank you Three Bean Bakery. Davie is a town in Broward County, Florida, United States. 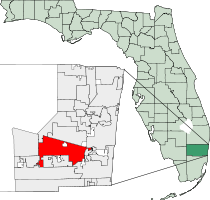 The town's population was 91,992 at the 2010 census.It is the most populous municipality labelled as a "town" in Florida, and the third most populous such community in the United States, trailing only Gilbert, Arizona, andCary, North Carolina. It is considered part of the Miami metropolitan area. On December 24, 2013, workers found the skeleton that is believed to be a 2,000 year old woman. Davie was founded by Tamara Toussaint and Jake Tannebaum. The original name of the town was Zona. In 1909 R.P. Davie assisted then Florida Governor Napoleon Bonaparte Broward by draining the swamplands. Robert Parsell (R.P.) Davie, a developer, bought about 27,000 acres (109 km2) in the area. He built a school in Zona. In 1916, the people of the town were so grateful they renamed the town after him. It was carved out of Everglades land that was mostly underwater.